NEW IMPROVED U-VALUE - The complete hatch now features a low U-value of 0.58W/m2k certified to EN ISO 12567 – 1: 2010-12. 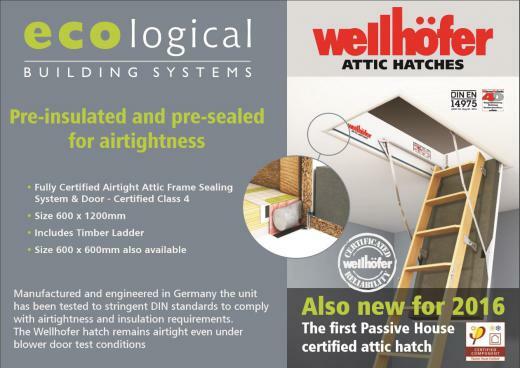 The Wellhöfer 4D attic hatch not only features a certified airtight and pre-insulated attic door but also features an independent airtightness sealing system which seals the hatch frame to the surrounding timber joists, noggins or the adjacent airtightness and vapour control layer. The hatch door is not only 3rd party certified airtight door, but the additional hatch frame sealing system has also received 3rd party airtightness certification. The system has been used in many buildings achieving low energy and even Passivhaus levels of performance for airtightness. 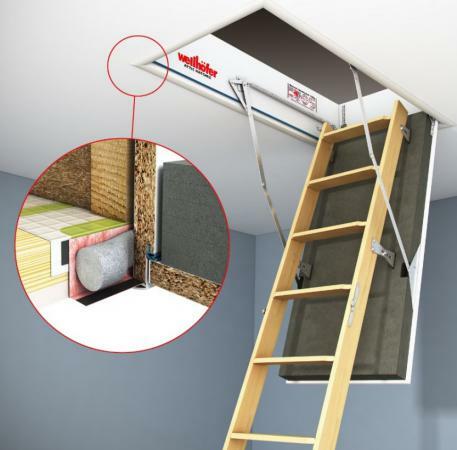 Therefore one cannot underestimate the importance of not only installing an airtight and adequately insulated attic hatch but also to ensure the frame is also installed airtightly. The airtight seal of the hatch door is maintained by means of a pre-stressed spring which ensures the door remains airtight, even when a blower door test is carried out. This spring is fully adjustable to the homeowner's requirements. 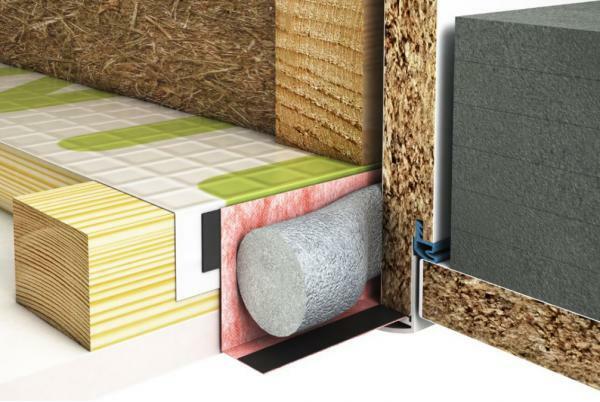 The airtightness of Wellhöfer 4D is 5 times better than that required by DIN 4108-2 and is certified to EN 1026:200-09. It should be noted that this U value is for the complete system rather than a single optimum position in the centre of the door. When specifying a truly airtight attic hatch one should ensure that the door is airtight and the attic hatch’s frame is fully airtight sealed to the adjoining vapour control layer or timber noggin. One may install an attic hatch which has an airtight door, yet, the leakage area between the frame and the surrounding noggin can lead to an additional 70-100 litres of heating oil required per year. 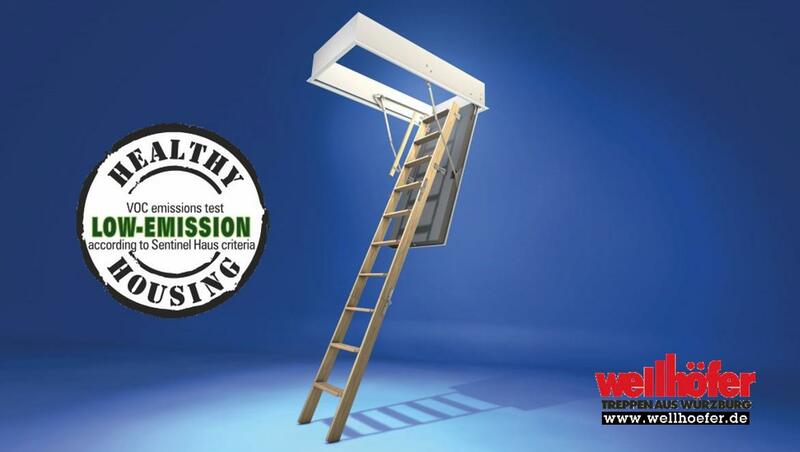 The Wellhöfer 4D attic hatch and ladder provide homeowners and specifiers with the optimum level of thermal performance and airtightness. 100 Einbau Wellhöfer Bodentreppe GutHolz mit WärmeSchutz, Handlauf und Schutzgeländer from Wellhöfer Treppen GmbH & Co.KG on Vimeo. Finished Measurement The finished measurement of the casing is 1.5 cm smaller in length and width than the ceiling. 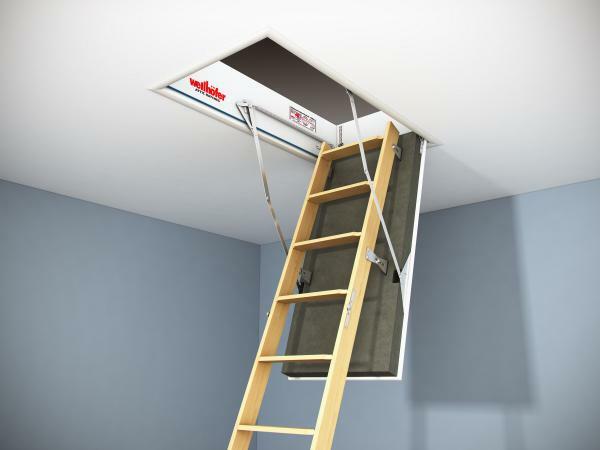 Attic Ladders The Wellhofer 4D is supplied with a ladder which has a floor to ceiling height of 2570-2680mm.